Treatmentaged if you suspect you have an infection, or if you have a medical condition that puts your feet at high risk—for example, diabetes, nerve damage in the foot, or poor circulation. Permanent removal. Various techniques may be used to destroy or remove the nail root. 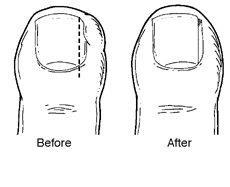 This treatment prevents the recurrence of an ingrown toenail. Your foot and ankle surgeon will determine the most appropriate procedure for you. Following nail surgery, a light bandage will be applied. Most people experience very little pain after surgery and may resume normal activity the next day. If your foot and ankle surgeon has prescribed an oral antibiotic, be sure to take all the medication, even if your symptoms have improved. Myth: Cutting a notch (a “V”) in the nail will reduce the tendency for the nail to curve downward. borders is a good way to treat ingrown toenails. toenail treatments at the drug store.